February 7 is the 49th anniversary of the article that kicked off gay community organizing in Portland. Follow this link to read about it. 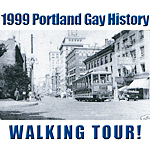 The City was an all-ages LGBTQ-friendly club during the 1980s-90s. We're starting to document its history. an overview of community articles and photos about Oregons Asian Pacific Islander LGBTQ community. Follow this link to check it out. CHECK THIS OUT. WE ADDED PICTURES! We are proud to provide a forum for activists and scholars. Visit these pages to see what's in our online archive. See what's coming up, and what GLAPN has been up to in the recent past. NORTHWEST Follow this link to read more about, and see previous year's Heroes. In 2012, GLAPN started naming a Queer Hero for every day in June, as part of our celebration of Pride. It has been a great way to recognize the history-makers of our community. We're pleased to promote these historic texts by GLAPN members and friends, along with information on how to purchase them. 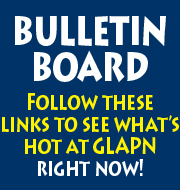 Follow this link to see what's on GLAPN's You Tube channel. Since January, 2008, GLAPN has produced, or helped to produce, a number of events of historic interest to the LGBTIQQ community. Some programs mark significant anniversaries, some, such as the Our Stories Series, involve community activists and elders sharing personal reminiscences around significant issues. SOCIETY Our physical collections are part of the library at Oregon Historical Society. Visit this page to see what's in the GLAPN archive at OHS, and to review finding guides. GLAPN has video recordings of some of our historic programs, and several of our friends have written books. Our friends can support real, live historians by purchasing these items. Follow the link to see what is available now. Learn about our organization, our history, our community affiliations, and our ongoing activities. Do you need help with a history project? Can we provide a speaker for an event you're planning? Do you have information for us? Do you want to donate items or an entire collection that's relevant to northwest Queer history? Do you want to give us money? Are you interested in volunteer opportunities? Visit this page for our Wish List, and contact information. Many of our friends have kindly shared links with us. If you visit their pages, tell them that GLAPN sent you! donation using your credit card.